The state found that every home tested had lead contamination in the soil that exceeded Californiaâ€™s screening level of 80 parts per million. One home in Boyle Heights had samples above 580 parts per million. The preschool, which is farther north, was at 95 parts per million. State officials stressed that those levels do not pose an acuteÂ risk for adults living there. The pollution is a â€œconcernâ€ for children and pregnant woman, and officials said they were calling residents Monday to tell them stay away from bare soil, wash their hands and grow vegetables only in raised beds. By Jessica GarrisonMarch 11, 2014,Â 9:06 a.m.
Officials plan to hold a community meeting next week to discuss elevated levels of lead found in soil at homes and a preschool near a battery recycling plant in southeast Los Angeles. The findings have prompted officials to issue health precautions and order expanded testing in more neighborhoods. State officials said the initial testing of 39 homes and apartments as well as two schools concerned them enough that they orderedÂ Exide TechnologiesÂ to create a plan for more testing and to protect children and pregnant women living in the area. This marks the first time the state has found widespread ground contamination in residential areas near Exide. The testing occurred this year in Boyle Heights and Maywood. The state found that every home tested had lead contamination in the soil that exceeded Californiaâ€™s screening level of 80 parts per million. One home in Boyle Heights had samples above 580 parts per million. The preschool, which is farther north, was at 95 parts per million. The pollution is a concern for children and pregnant woman, officials said. They were calling residents Monday to tell them to stay away from bare soil, wash their hands and grow vegetables only in raised beds. â€œThis is not an emergency situation, but we are still concerned and demanding that Exide take actions to protect public health,â€ said Brian Johnson, deputy director of the California Department of Toxic Substance Control. Officials plan to hold the community meeting March 19 at Resurrection Church in Boyle Heights. Exide has been the subject of much debate in the year since the South Coast Air Quality Management District issued a study showing that the plant’s arsenic emissions posed a danger to more than 100,000 nearby residents. March 10, 2014,Â 4:45 p.m.
Elevated levels of lead have been found in the soil of homes and a preschool near a battery recycling plant in southeast Los Angeles, prompting officials to issue health precautions and order expanded testing in additional neighborhoods. State toxics officials said the initial testing of 39 homes and apartments as well as two schools concerned them enough that they orderedÂ Exide TechnologiesÂ to create a plan for more testing and to protect children and pregnant women living in the area. This marks the first time state officials have found widespread ground contamination in residential areas near Exide. The testing occurred this year in Â Boyle Heights and Maywood. Officials plan to hold a community meeting March 19 at Resurrection Church in Boyle Heights to discuss the testing. Exide has been the subject of much debate in the year since the South Coast Air Quality Management District issued a study showing that Â its arsenic emissions posed a danger to more than 100,000 nearby residents. Exide also been cited repeatedly for releasing unsafe levels of lead into the air. Testing did not show elevated levels of arsenic in any of the yards. 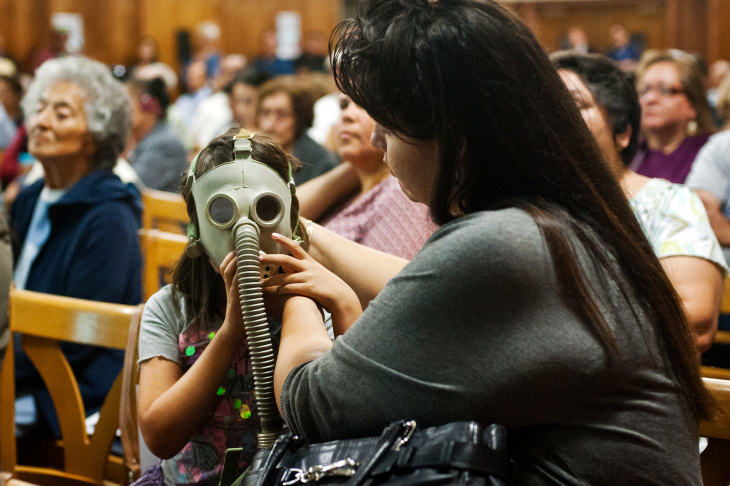 Diana del Pozo-Mora, right, puts a gas mask on her seven-year-old daughter, Josephine Mora, during a town hall meeting at the Resurrection School on Tuesday, Oct. 8 about Exide Technologies, a lead-recycling plant in Vernon. State toxics regulators say new tests reveal concerning levels of lead in soil at homes near a battery recycling plant in Vernon. Theyâ€™re asking Exide Technologies to take action to protect human health. The Department of Toxic Substances Control ordered environmental testing of soil at 39 homes and two schools near the Exide facility at 2700 South Indiana Street. While the battery recycler has been known to emit arsenic, the samples did not reveal high levels of that toxic metal. All of the homes tested positive for levels of lead that require additional testing and evaluation, according to the DTSC. Neither school showed lead problems in its soil sample. But test results did find unexpected levels of the substance at the Volunteers of America Salazar Park Head Start pre-school program. Now regulators are ordering more sampling for lead, both at houses already visited, and others in the areas north and south of Exideâ€™s facility. The company must present a plan for this new round of testing by next Friday. Regulators have also ordered Exide to address any lead contamination above acceptable levels, especially in houses where pregnant women or children live. “Our residents have the right to know the full extent to which lead levels constitute harm,” said State Senator Kevin DeLeon, in a release. Exide has been under serious scrutiny in the last yearÂ â€“Â ever since a report from theÂ South CoastÂ Air Quality Management District linked the recyclerâ€™s emissions to heightened cancer risk for over a hundred thousand people in surrounding communities. Air regulators have sued for $40 million inÂ penalties related to the Exide’s emissions.Â Theyâ€™ve also sought to shut down the Vernon plant. VERNON, LOS ANGELES (KABC) –Â Elevated levels of lead have been found in the soil of homes and a school near a battery recycling plant in Vernon. Residents are being warned not to let their children go near bare soil after elevated levels of lead were found in 39 homes as well as Salazar Park Head Start School. Authorities say the nearby Exide Technologies plant is to blame. Officials with the Department of Toxic Substance Control has ordered Exide to do more sampling. This is the latest in a string of problems surrounding the plant. Back in January, regional air quality officials sued Exide for $40 million, saying the plant exposed people to cancer-causing chemicals such as arsenic. As for this recent lead discovery, the Department of Toxic Substance Control gave Exide until March 21 to come up with a plan to protect people in the area. In response, Exide said it is studying the department’s response and will work cooperatively to conduct the additional sampling and the interim cleanup measures. Lead is toxic to everyone, but unborn babies and young children are at greatest risk. In addition to cautioning residents to avoid bare soil, officials advise to wash any homegrown produce thoroughly before consumption and try to plant produce in raised planters rather than inside grounded soil. NBC4 News at 11 on Monday, March 10, 2014. Elevated levels of lead were discovered in the soil of 39 homes and two schools near a battery recycling plant in Vernon, state officials announced Monday. Test results confirmed the ground contamination near Exide Technologies at 2700 South Indiana St., the California Department of Toxic Substances Control said. “I think itâ€™s absurd, I think itâ€™s very disappointing for the city and I think a lot of people are upset and I think it needs to get fixed right away,” a resident in the affected area said. Though officials said the lead levels weren’t an immediate health threat, the company was ordered to perform more test and come up with a plan to protect children and pregnant women in the area before March 21. “We really believe that this could have a very negative potential health problem for our children and for pregnant women in the community, State Assembly Speaker John Perez said. Residents near the troubled facility are being urged to keep their children away from bare soil, to wash their hands and to only grow vegetables in raised beds. In January, regional air quality officials sued Exide for $40 million, claiming the plant exposed people to cancer-causing chemicals such as arsenic. “Department of Toxic Substance is actually listening this time, much in the same way they were last year when they shut the plant down,” Perez said. In April 2013, Exide Technologies wasÂ shut down by state officialsÂ after reports from air regulators that the facility failed to control airborne pollution. According to the Department of Toxic Substances Control, the company had continuously been releasing hazardous waste into the soil through rotting underground pipes that were cracked and littered with debris. The pipes date back to the 1920s. EAST LOS ANGELES (CBSLA.com)Â â€”Â A studyÂ has found lead contamination in the soil surrounding a controversial battery recycling plant in Vernon, according to state regulators. ExideÂ Technologies, which melts and recycles thousands of car batteries daily, is surrounded by some of the most densely populated residential neighborhoods in Los Angeles County. Soil was tested in two neighborhoods near the Exide Technologies battery recycling plant during a study commissioned by the company at the request of state regulators. Nearly 39 homes and twoÂ schoolsÂ were tested in the neighborhoods of East Olympic Boulevard and South Indiana Street in Boyle Heights, and South Downey Road and Slausson Avenue in Vernon. Most of the samples showed elevated levels of lead in the soil, including a sample from Salazar Park Preschool. The state concluded one home was above the hazardous waste level. The state issued a community notice to residents with recommendations for reducing the risk posed by contaminated soil. Residents are urged to keep children away from bare soil, wash childrenâ€™s hands when they come inside, and place doormats inside and outside entrance doors. One woman whose home was tested told KCAL9â€²s Randy Paige she had not been informed of the results of the state report. She asked that her identity not be disclosed. â€œThatâ€™s scary. It is scary to find out,â€ she said. John Moretta, Monsignor at Resurrection Church, said the state findings do not show the extent of contamination. â€œItâ€™s not just 39 homes, 39 homes that are tested. Weâ€™re talking about a whole community here,â€ he said. A representative from Exide was unavailable for comment Monday. The company has told state regulators in documents that it does not believe it isÂ responsibleÂ for lead contamination in the area, citing lead paint and leaded gasoline.